The Hospital of Lithuanian University of Health Sciences Kauno klinikos is the largest healthcare institution in Lithuania. 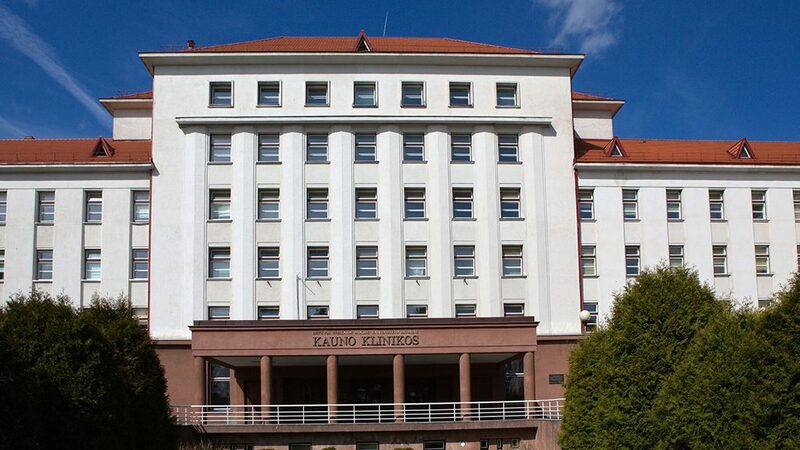 The Hospital has two founders: the Ministry of Health and the Lithuanian University of Health Sciences (LSMU). Established in 1940, the Hospital has grown into one of the most prominent hospitals in the country. Hospital of Kauno klinikos is dedicated to providing the highest quality healthcare to patients from all over the country and abroad. Kauno klinikos employs more than 1200 physicians and 2400 nurses, who provide care according to the standards of evidence-based clinical practice. The hospital has 38 departments devoted to all medical and surgical specialties, including cardiovascular surgery, neurosurgery and organ transplant surgery. The Hospital’s specialists have brought many medical firsts and ‘onlys’ to Lithuania, including the first use of foldable intraocular lenses for cataract surgery, endobronchial ultrasound for lung cancer diagnosis, the first use of capsule endoscopy to diagnose inflammatory bowel disease, transcatheter aortic valve implantation, and many other minimally invasive diagnostic and treatment techniques. In recent years, 22 centres for rare diseases have been established in Kauno klinikos to enable effective collaboration among different specialities treating rare conditions such as neuromuscular disorders, cystic fibrosis, pulmonary hypertension, neuroendocrine tumours, etc.